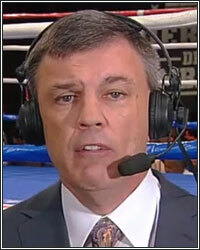 TEDDY ATLAS: "I'M CONFUSED WITH THE BIG SHOTS AT HBO"
"I think that's asbsurd. I don't understand what the people at HBO, and I guess they're smarter than me, but I don't understand what the big shots there are doing when they give something in the contract that tells the fighters that if you lose, you're going to get a million dollar fight and another fight on our network if you lose. I've never heard of something like that. To me, it's not good business. To me, again, they're smarter than me, but it doesn't make sense," remarked ESPN2 analyst Teddy Atlas, who took HBO to task for guaranteeing the loser of last weekend's bout between Timothy Bradley and Devon Alexander another appearance on the premium cable network worth 1.25 million dollars. As we now know, the loser of the bout was Devon Alexander, who complained that he was unable to see after an unintentional headbutt in the 10th round forced a halt to the action. Atlas points out that perhaps HBO's decision to guarantee the loser a comeback fight worth $1.25 million, before the bout had even taken place, may have played a role in Alexander's decision to fight through the adversity. "Would you tell your children that if you don't clean up your room, and I know that my kids used to make a mess, if you don't clean up your room, you're still going to get you allowance. Do you think that those shirts would be picked up from the floor," he added. "Again, I'm confused with the big shots at HBO making a deal with a fighter saying, 'You lose, don't worry about it. You'll be back on air. You'll get plenty of money.'" Does Teddy Atlas have a point? Is it easier to lose your undefeated record if you're guarantedd a minimum of $1.25 million for your next fight? Let us know your thoughts in the comments below.